Commencing its services in the inner suburb of Carlton in 1956, The Holy Church of St. George served the religious needs of post-war Greek migrants of the area. Its first ten years saw church services held in a rented property belonging to the Methodist Church on the corner of Lygon & Queensberry streets Carlton, with plans to move into a permanent residence later on. The church began by the decree of the GOCMV and according to the GOCMV minutes, the committee had initially planned to build both a church and a school at Illoura House, 424 St. Kilda Road; however the plans did not come to fruition but services continued at the Carlton premises until Sunday 16th January 1966. It was at this time that the Committee decided to relocate the church from Carlton to the Thornbury area. The Holy Church of St. George relocated to Thornbury in 1966; committee meeting minutes from the 12th January describes the decision to move. 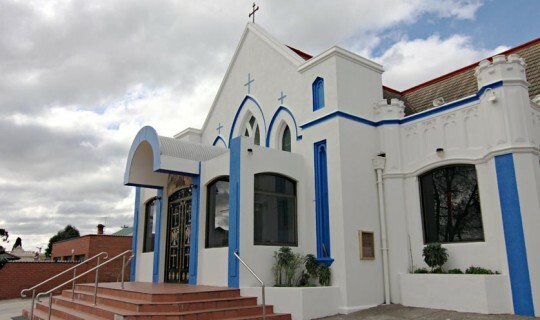 Initially operating from the corner of Martin and Armadale Streets, the church in Thornbury later relocated to its current site 66 St. David St, which was purchased in the 1970s. Today it still serves local parishioners every week.